The manga is pretty old, so I doubt this is helpful, so if you anyone knows anything similar, please let me know because it might be that one. 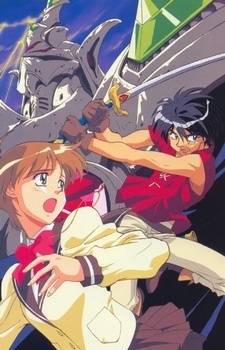 "The Vision of Escaflowne" (Tenkuu no Escaflowne) maybe? If it had giant armour mecha. In this new land, Hitomi soon discovers that Van is a prince of the Kingdom of Fanelia, which soon falls under attack by the evil empire of Zaibach. In an attempt to fight them off, Van boards his family's ancient guymelef Escaflowne—a mechanized battle suit—but fails to defeat them, and Fanelia ends up destroyed. Now on the run, Hitomi and Van encounter a handsome Asturian knight named Allen Schezar, whom Hitomi is shocked to find looks exactly like her crush from Earth. With some new allies on their side, Van and Hitomi fight back against the forces of Zaibach as the empire strives to revive an ancient power. What movie had a John Stamos-like character dreaming on a medical spaceship?